Collect: Almighty God, give us grace to cast away the works of darkness, and put on the armor of light, now in the time of this mortal life in which your Son Jesus Christ came to visit us in great humility; that in the last day, when he shall come again in his glorious majesty to judge both the living and the dead, we may rise to the life immortal; through him who lives and reigns with you and the Holy Spirit, one God, now and forever. Amen. Happy New Year! This Sunday, December 2, 2018, is the first day of the New Year for the Church. It is the first Sunday of Advent. The Church Calendar is designed to remind us of specific events in the life of Christ. The Church Calendar reminds us of the fact that the most momentous event in the history of humankind took place when he who was in the form of God took on human form, was born of a virgin, was circumcised, was visited at birth by shepherds and later by magi, grew in wisdom and stature, was baptized at the beginning of his ministry and was declared by the Father to be his Beloved Son, that he taught, healed, stilled nature, died on the cross for our sins, was resurrected and ascended into heaven, where he now reigns at the right hand of God. Advent comes from the Latin “adventus,” translated “coming.” In Advent, we are reminded of the three comings of Christ, two in the past, and one yet to be. The first Advent was when Christ came in the flesh and walked among us. At Christmas, we celebrate this event, the Incarnation, the birth of Jesus. We must be careful at Christmas to not fall into the popular mode of worshipping a baby. We worship a resurrected king-our God who exists in a glorious body and who sits on the same throne as God the Father in the supreme position of honor, at God’s right hand. The second coming of Advent that we celebrate is when Jesus came into our lives. We received him, as St. John says in the Prologue to his gospel, and we became children of God. He continues to come into our lives in many ways. And he comes into our lives in the Eucharist, in the simple elements of bread and wine, elements that become his body and blood. The third coming is yet to be. It will be the Parousia. Parousia is a Greek word that has its secular origins in Caesar entering into a city. This was a high honor for the citizens of that city. Knowing Caesar was on his way to visit, the citizens of that city prepared for his coming by sweeping the streets, preparing buildings and roadways, and dressing in their finest. When Caesar appeared, the town’s officials welcomed him warmly, trumpet blared, drums were beaten, and its citizens lined the streets and greeted Caesar with great joy. But not all of its citizens were filled with joy. Some were filled with dread. Caesar would soon be judging them, and many of these would be put to death. Candles and a wreath are the symbols of Advent. There are four Advent candles on the rim of an Advent wreath that is circular. Three of the candles are purple, and one is rose. The evergreen circle represents the Triune God as being a living, eternal being. In the center of the circle is a much larger white candle, the Christ candle. The four candles, each lit one after another during the four weeks of Advent, the first being lit this upcoming Sunday, draw our attention to four aspects concerning the ministry and life of Jesus. The first week the purple candle of hope and expectation is lit. The second week the purple candle of love is lit. We are to reflect solemnly on these two aspects, examining our lives under these candle’s lights and offering repentance and sorrow at the sad state of our world and our possible contribution to its misery. The third week the rose candle of joy is lit, the candle of Gaudete (“Joy”) Sunday, a candle offering us temporary relief from solemnness and sadness, pointing us to the joy soon to come. The fourth week the purple candle of peace and purity is lit, returning us to solemn reflection. The last candle, the white candle, the Christ candle, is reserved for Christmas Eve, and solemnity is now supplanted by celebration, fasting by feasting, and its light proclaims unadulterated joy in all of its glory as we rejoice in the birth of our Savior. It is now the time of carols, the exultant and triumphant hymns uniting heaven and earth in the reminder that our Lord came and walked among us, experienced everything we could possibly experience, but was without sin. It is a time in which the true and only gift that really matters has been given to us through Christ Jesus, the gift of true love and sacrifice. For him, the tranquil lyrics of our Christmas songs couldn’t encompass such terror. I think he has a point … The first Christmas carol, after all, was a war hymn. Mary of Nazareth sings of God’s defeat of his enemies, about how in Christ … he “has brought down the mighty from their thrones and exalted those of humble estate” (Luke 1:52). There are some villains in mind there. Simeon’s song, likewise, speaks of the “fall and rising of many in Israel” and of a sword that would pierce the heart of Mary herself. Even the “light of the Gentiles” he speaks about is in the context of warfare … [God’s] light overcomes the darkness (John 1:5), and frees us from the grip of the devil (2 Cor. 4). Our corporate worship [often] ignores this spiritual warfare … In a time when we seem to learn of a new tragedy each day, the unbearable lightness of Christmas seems absurd to the watching world. But, even in the best of times, we all know that we live in a groaning universe, a world of divorce courts and cancer cells and concentration camps. Just as we sing with joy about the coming of the Promised One, we ought also to sing with groaning that he is not back yet (Romans 8:23) sometimes with groanings too deep for lyrics. Rightfully practiced, Advent makes the celebration of Christmas that much more meaningful and joyful. 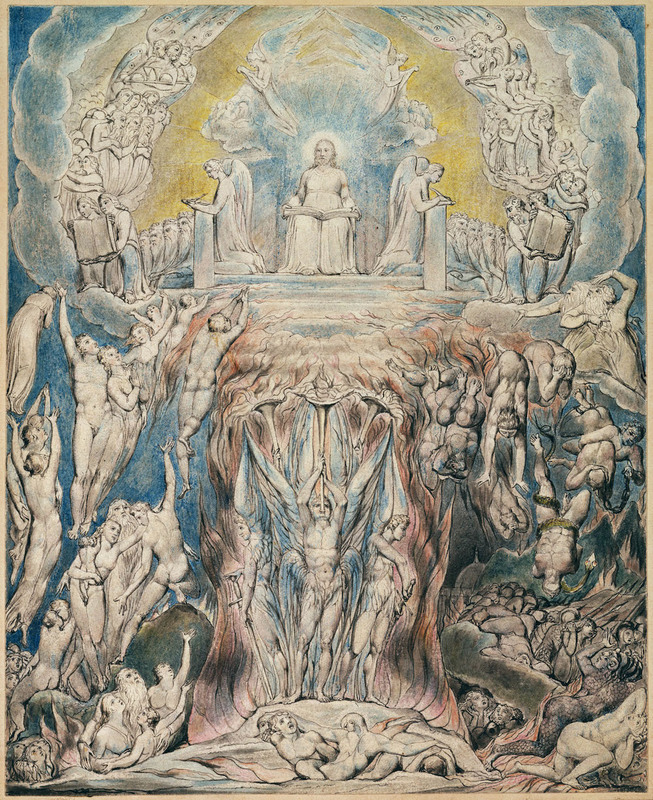 The main point in today’s lessons is this: Advent teaches us that even though the world is in a mess, it will be set right when Jesus the Judge comes again at the end of this evil age; this setting right of all things is the consequence of the First Advent when Jesus the Redeemer appeared in his Incarnation. We live in the time when salvation is offered to all. But when Jesus comes again, the time in which people can decide to follow Jesus will be over. That will be the time of judgment. We are thus to keep our eyes on the signs of the times and await expectantly the final victory of our Lord and Savior. Our lessons for today, the psalm and the gospel of this first Sunday of Advent are passages of anticipation pertaining to the Second Coming. Jesus gives you and me this command: “Now when these things begin to take place, straighten up and raise your heads, because your redemption is drawing near.” Unlike the world that will fear and faint and be filled with dread, we should not have foreboding, a sense of terrible expectation due to terror, but our terrible expectation should be one due to joy. Jesus then tells a parable. He likens the leafing of a fig tree to the changing of the seasons that occurs to a fig tree. Fig trees are, to this day, an important tree in Israel, and they are numerous in the Garden of Gethsemane. As we see these signs, we will “know that the kingdom of God is near.” Then one of the most controversial and misunderstood proclamations of Jesus occurs: “Truly, I say to you, this generation will not pass away until all has taken place.” Many believe that Jesus is referring to the disciples. But it seems to me that the best way of understanding what Jesus is saying is to see that he is referring to the generation that witnesses the leafing of the fig tree. I firmly believe that we are seeing buds appear on the fig tree. As to how large these buds are at present, we do not know. How long it will take them to leaf, I also do not know. 1 Behold, a day is coming for the Lord, when the spoil taken from you will be divided in your midst. 2 For I will gather all the nations against Jerusalem to battle, and the city shall be taken and the houses plundered and the women raped. Half of the city shall go out into exile, but the rest of the people shall not be cut off from the city. 3 Then the Lord will go out and fight against those nations as when he fights on a day of battle. 4 On that day his feet shall stand on the Mount of Olives that lies before Jerusalem on the east, and the Mount of Olives shall be split in two from east to west by a very wide valley, so that one half of the Mount shall move northward, and the other half southward. 5 And you shall flee to the valley of my mountains, for the valley of the mountains shall reach to Azal. And you shall flee as you fled from the earthquake in the days of Uzziah king of Judah. Then the Lord my God will come, and all the holy ones with him. 6 On that day there shall be no light, cold, or frost. 7 And there shall be a unique day, which is known to the Lord, neither day nor night, but at evening time there shall be light. 8 On that day living waters shall flow out from Jerusalem, half of them to the eastern sea and half of them to the western sea. It shall continue in summer as in winter. 9 And the Lord will be king over all the earth. On that day the Lord will be one and his name one. When we attempt to put various Old and New Testament prophecies together, such as Ezekiel 38 and 39 and Armageddon in Revelation tell us that the nations will raise up against Israel. It is during this final battle that Christ will come again in the clouds, and when he does, he will step upon the Mount of Olives and it will split apart. Those who survive the plunder of Jerusalem will be able to escape through this cleft. We do not know what “Azal” refers to. Amos dates his prophecy as occurring two years before the earthquake of Uzziah, king of Judah, when Jeroboam was king of Israel. Uzziah attempted to supplant the priests and entered the Temple to burn incense. This brought about a massive earthquake, which rent the curtain separating the Holy Place from the Holy of Holies, and sunlight suddenly shined through the rent veil, and struck Uzziah’s face, resulting in leprosy covering his whole body. The people of Jerusalem fled from the stricken city. “Then Yahweh my God will come, and all the holy one with him.” This could well be the clouds that are referred to when Jesus come again. Remember Hebrews 12:1, “Therefore, since we are surrounded by so great a cloud of witnesses…” Thus, the clouds could well be all of the saints who are now with Jesus, as well as all of the angelic beings. And there shall be a unique day, which is known to the Lord, neither day nor night, but at evening time there shall be light. 8 On that day living waters shall flow out from Jerusalem, half of them to the eastern sea and half of them to the western sea. It shall continue in summer as in winter. 9 And the Lord will be king over all the earth. On that day the Lord will be one and his name one. Once again, Advent reminds us that the Judge will come, and those who do not know him will suffer eternal punishment. This fact is now denied by not just the world, but also by a number of Christians. There is now the prevailing notion that Jesus is just one way to salvation, and that despite what Scripture states, all of us are basically good. Advent reminds us that Jesus, the Redeemer, is also the Judge, and that no one comes to the Father except through him. So the Advent Season reminds us that we await his coming again with expectation. One of our Advent disciplines should that of prayer. This is the time for us to pray for those whom we love who do not know Jesus. That the Second Advent will become real in their lives. This is the time for us to pray for open doors to others who do not know him. We should fear for their souls if they do not come to Jesus. We should be preparing ourselves to answer the questions of non-believers with love and gentleness. If we are not careful, we can become so caught up in the joy of Christmas that we forget, as mentioned earlier, that shortly after the birth of Christ Herod slaughtered the innocents. Jesus came into a sinful and violent world to offer us newness of life. Advent reminds us that this season is a bittersweet season. Advent reminds us that we are in the midst of a spiritual warfare. That doesn’t mean that we shouldn’t take delight in Christmas. I get quite emotional during the lightings of candles while we sing “Silent Night.” The beautiful “O Holy Night” will bring me to the point of tears. We can still take joy in the beauty of the Christmas story. Let me end with the story of Henry Wadsworth Longfellow’s poem, “Christmas Bells,” composed during the height of the Civil War. It is a poem that captures the bitter sweetness of this season, but also proclaims the ultimate victory of God. Earlier, his wife got too close to the fireplace and her dress caught on fire, burning her severely. She died several days later in excruciating agony. Longfellow tried to save her, but his face got so badly scarred, he grew a beard to hide his scars.